The Venom is our newest design for the serious hunter who expects exceptional quality. the Venom shaft incorporates our FWT (Forward Weight Technology) with more weight up front and double the wall thickness for the first 9" of shaft. The Venom is a hi-quality crossbow arrow that puts more FOC in the shaft and at 385g for raw shaft, it is the heaviest shaft available. No need for expensive brass inserts which add weight but no FOC in the shaft. 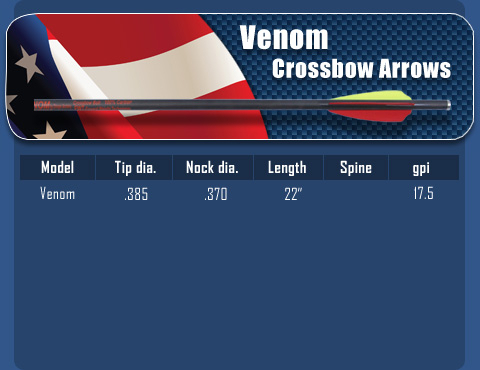 The Venom is made from hi-modulus, 100% carbon with flat or half-moon nocks. Made in USA!